Tomatin distillery is introducing a range of duty free products with a series of exclusive whiskies available now in airports across Europe to be followed by the US and Asia over the next few years. The age statement collection comprises the distillery’s flagship 12 year old and three travel retail exclusive editions: an 8 year old, a 15 year old and a rare 40 year old vintage. Stephen Bremner, sales director comments: "We have been working on a strategy to establish our presence in the travel retail market for some time now in response to growing demand for Tomatin single malt on a global level. While the majority of Scotch brands have elected to present no-age statement duty free ranges, our collection of age statement whiskies provides a point of difference. This is a priority market for us as it provides an introduction to Tomatin for thousands of globe-trotters so we wanted to create a range that caters for all tastes and budgets, whether you’re a whisky novice or a high-end collector. "The range is already en route to several airports and we look forward to seeing the brand in airports across Europe over the coming months. There’s great potential in each of these markets and we hope that the success we have seen recently with our core range will be mirrored within travel retail, with sales of the core Tomatin range increasing dramatically over the past few years. We have seen sales growth of 60% in our branded goods over the last 4 years and currently exports make up 92% of our business. It’s an encouraging sign for the future." Introducing the series is the 8 year old, matured in bourbon and sherry casks. Bottled at a strength of 40% with an RRP of €35. 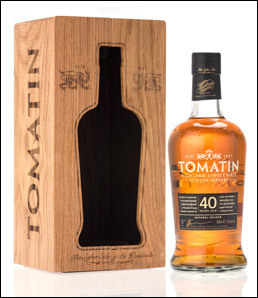 The Tomatin 12 Year Old is a 1 litre version of the distiller’s flagship malt, with an ABV of 43% and an RRP of €41.50.The 15 year old is matured in North American oak. Bottled at a strength of 46%, the limited edition retails at €55. The final expression is a 40 year old malt matured in oloroso sherry casks. Retailing at a price of €1250 and bottled at 43%. In addition to Tomatin single malt, the range will also include a 1 Litre bottle of standard edition Cù Bòcan. This is the distillery’s only peated expression originally launched in 2013.